Tilahoun Gessesse was one of the most popular singers of Ethiopia‘s “Golden Age” in the 1960s – nicknamed “The Voice”. There are four posts (so far) that cover the legendary musician over at the mighty Likembe blog. Once Tilahun arrived in Addis Ababa, he immediately began to show his talent. He was first hired by the Hager Feker Association, which is nowadays known as Hager Feker Theater. After a few years at the Hager Feker Theater, Tilahun joined the Imperial Body Guard Band where he became a leading star singer. He then moved to the National Theater where he became famous and successful with his wonderful voice. Tilahun was so famous that he appeared three times in front of His Majesty, Emperor Haile Selassie I. During his visit with his Majesty, His Majesty advised Tilahun not to abuse his gifted talent. Tilahun kept his majesty’s advice and has become the king of Ethiopian music and his name has also become a household name among all Ethiopians. Tilahoun Gessesse passed away on April 19th of 2009. A state funeral was held on three days later in Addis Ababa. 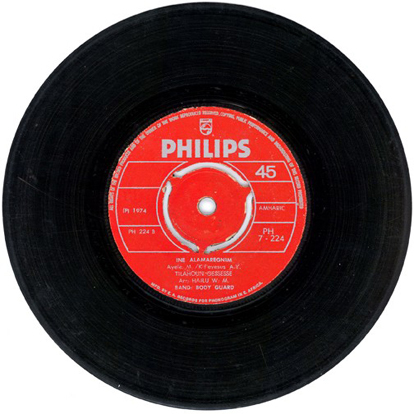 Catalog number PH 7-224 on Philips Records Ethiopia. No release date listed. AFICIONADOS are hoping for a revival of the golden age of Ethiopian jazz, as players who emigrated westward a generation ago, especially to America, come home amid the global recession. Tafari Assefa now plays his drums in a band at the bar of the Jupiter Hotel, one of the fancier newer establishments in Addis Ababa, the capital. Born in 1974, he studied music in Poland before emigrating to America. Life as a jazz man there was hard. “You had to beg for gigs,” he says. “Here, they call you.” He earned $70 a gig in America. Now, back home, he gets only $40. But the monthly rent, at $180, is several times less. He can get along. A cup of Ethiopian coffee, he notes, costs only 25 cents. Ethiopia’s jazz tradition goes back to the 1920s, when Armenian orphans from the massacres in Turkey were adopted by Ethiopia’s imperial court and formed a band called Arba Lijoch, meaning Forty Children. Other big bands followed suit. “The Addis swing” caught on. By the dying days of Haile Selassie’s reign, in the early 1970s, musicians were fusing jazz and funk with more traditional Ethiopian tunes to create a distinctive Ethio-jazz. After the grim Marxist regime of Mengistu Haile Mariam took over in 1974, Ethio-jazz soon died, along with much else. The communists were suspicious of free-form jazz. Many players and fans were killed or fled, mostly to America. Hotel bands were replaced with drab synthesisers. The doyen of Ethiopian jazz men is Mulatu Astatke, now 66, who used to divide his time between Britain, America and his home country, drawing inspiration from all three. When Duke Ellington visited Addis, Mr Astatke transposed some of the American bandleader’s numbers from the West’s eight-note scale into Ethiopia’s five-note scale. The revivalists reckon that cross-fertilisation of this kind can now start up all over again.